A masterful fusion of steel and aluminum, Pisces, the brain child of Dave Evens, is all business, authentic in every detail, and projects a confident presence that’s as honest as the grime on the rolled-up sleeves of a master shipwright. Curiously congruent with her declared mission as a long-range cruiser, the vessel’s purposeful workboat look would be as at home at an industrial waterfront as in an upscale marina. No pretense here, no veneer of the proletarian ethos that decorates many series-built character boats; Pisces is all business, authentic in every detail, and projects a confident presence that’s as honest as the grime on the rolled-up sleeves of a master shipwright. Owner David Evans has participated closely and actively in Pisces’ concept, design, and construction. The concept of her owner, Denver-area architect David Evans, Pisces reflects an appropriately pragmatic design brief that favors cruising enjoyment over slick outward appearance. “My intent here has been to avoid complexity in the boat’s design and construction,” he says, “and in the interest of low maintenance, to keep the materials list as simple as its integrity and function will allow.” In the aggregate, the boat offers an eclectic mix, juxtaposing classic lines and finishes with advanced materials and technologies, and with more than a little creative thinking in design and fit-out. 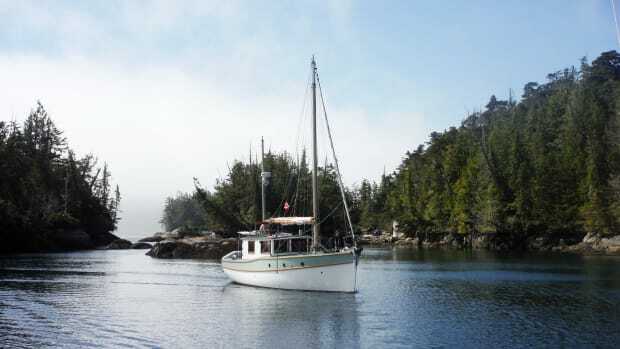 Like many experienced sailors—in this case beginning more than a decade ago with an 18-foot sloop, then graduating to a wood 1938 vintage 25-footer—Evans found little, if anything, in the current market that corresponded to his priorities and preferences as he contemplated a transition to power cruising, and so opted for a purely custom build. 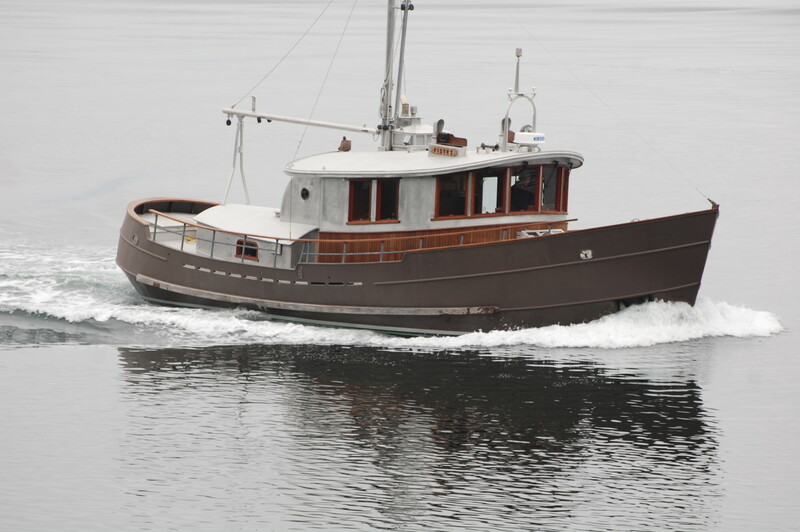 Working from an existing original concept and underbody design specifying a steel hull and aluminum superstructure, he turned to Patrick Bray, a naval architect and yacht designer based near Vancouver, British Columbia, for modifications including the addition of a bow bulb, and re-shaping the stern from that of a double-ender to a fuller, more rounded contour. 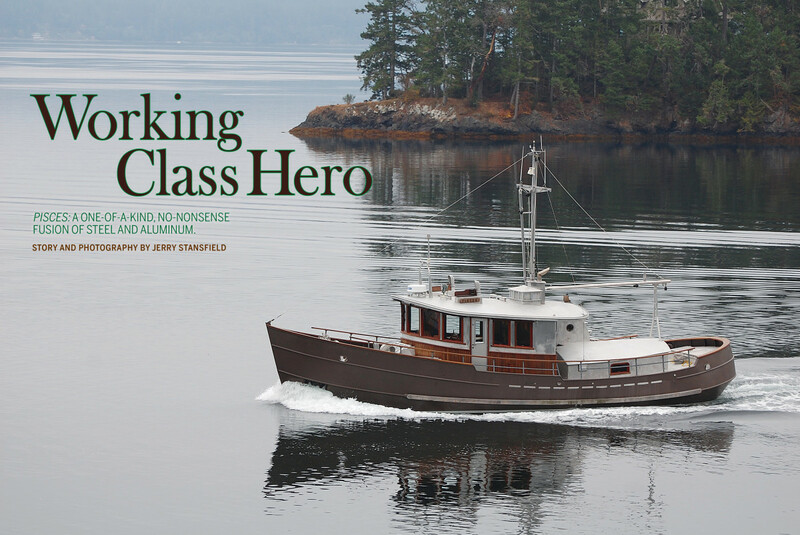 Following an unsatisfactory start at a Seattle boatyard, Evans moved the project to Jenkins Marine in Victoria, B.C., a builder whose portfolio includes a variety of commercial and recreational craft. Here, the incomplete hull was dismantled essentially to the keel, and begun anew, this time, according to project lead Jim Drummond, consistent with the Jenkins yard’s standard practices of precise lofting, rock-solid bracing of components prior to welding, and completing welds in an alternating back-and-forth pattern to prevent distortion from uneven heating. Angular hull frames support steel plating devoid of compound curves, Drummond added, the better to allow larger plate area and therefore fewer welded seams. Accordingly, the finished product reveals uniformly even surfaces, expert alignment of frames, and seams that, far from interrupting overall contours (no fairing compound on Pisces), serve instead to celebrate the underlying structure. Soapstone countertops and brushed-nickel hardware enrich the well-equipped galley. The unusual deep-V displacement hull begins at a substantial box keel, with bottom contours in an unusually aggressive deadrise of about 20 degrees, extending upward through a hard knuckle to a yet steeper angle just below the waterline. A shallower flare around the curve of the transom adds buoyancy near the waterline to resist any tendency of the stern to settle as the boat approaches hull speed, effectively negating bow rise throughout the power curve. The details on Pisces are as hard-nosed and fuctional as one could imagine. A single 240hp Lugger diesel drives a 40-inch Kaplan 4-blade propeller that turns within the circumference of a Kort-type nozzle by NautiCan. Rare on pleasure cruisers but a common fixture on tugs and other workboat types, the ducted propeller typically is specified for the increased pulling power it generates compared to an open propeller. Variations in duct geometry, however, also offer potential gains in range between 10 and 30 percent, at speeds below 15 knots. 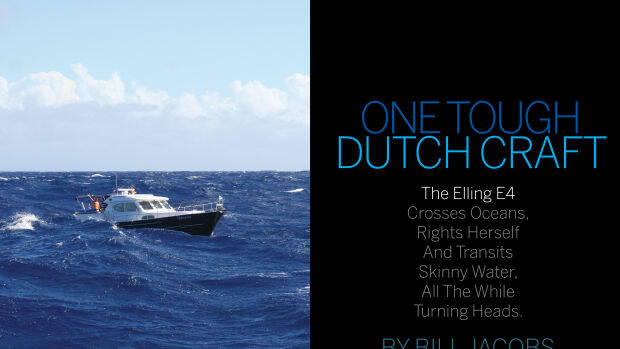 Olds Engineering of Australia recently tested identical 72-foot trawlers, one fitted with a Rice Speed Nozzle—similar to the NautiCan unit—another with a conventional open propeller, and reports that the nozzle achieved a 23-percent reduction in fuel consumption and a gain in free running speed from 9.3 to 10 knots. While Evans was able to acquire his at a favorable price, the typical cost of a speed nozzle—estimated at upwards of $12,000 to $15,000—may well cause most owners to think twice about committing to a similar installation. Pisces is also fitted with a Schilling-type (fishtail) rudder; its compound foil cross section increases lift—turning force—compared to flat or simple foil shapes. This rudder type, says Evans, is effective at twice the normal centerline deflection of about 35 degrees, and in this case swings through 70 degrees to either side, at its extremes diverting propeller thrust to a nearly lateral vector, and, in effect serving as a stern thruster. As such, it produces only moderate and manageable forward motion—easily overcome with an occasional nudge in reverse—while maneuvering sideways in tandem with the 12-inch Keypower hydraulic bow thruster. This kind of system, of course, can exert substantial loads on the rudder and supporting structure, so the top end of the rudder post is braced by a massive steel framework against the turning loads of an appropriately oversized hydraulic ram; a keel shoe extending beneath the nozzle provides a lower bearing as well. The boat’s construction has employed an intriguing method of joining dissimilar metals in a manner that prevents the otherwise certain occurrence of galvanic corrosion. The process, called Detacouple, or explosion welding, was developed by DuPont during the 1950s, and since then has been used in the construction of military vessels, LNG carriers and other commercial vessels as well as in some recreational craft (PMM, Jan. 2000), most frequently for the purpose of securing aluminum structure to a steel hull or deck. In this case, steel and aluminum bar stock are layered beneath an explosive charge which, when detonated, drives one bar against the other with sufficient instantaneous force—some 4 million lb. per square inch—to produce a metallurgical bond that preserves the properties of each metal as it forms a barrier against electrolysis. The bi-metal stock can then serve as a union, with its steel face welded to the steel deck and the aluminum superstructure welded to the aluminum face. 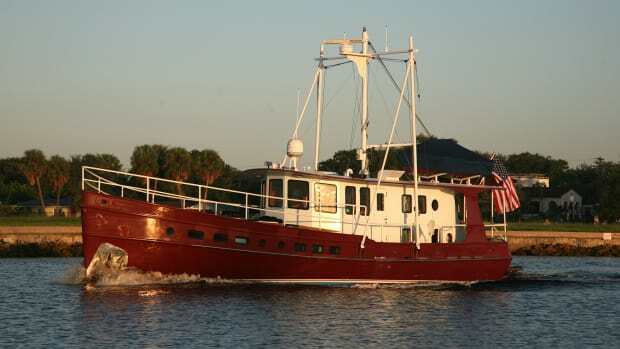 Thus, Pisces boasts the strength of her steel hull, the lighter weight of her aluminum deckhouses, and the permanence of a fully welded structure in lieu of a mechanical join. Pisces’ superstructure comprises two separate deckhouses, a pilothouse/galley/saloon, and aft, the master stateroom with an adjoining head. Apart from the nonskid textured cabin-top decks and a wainscot of brownheart hardwood encircling the forward house, exterior aluminum surfaces are unfinished. Overall styling is decidedly classic, and features an aggressive positive sheer line, emphatically cambered cabin tops, and even an old-timey overhead enclosure sheltering the companionway that leads down from the main deck to the aft stateroom. Cowl vents by Paul Luke complete the time-honored look, and deck prisms illuminate below-deck living spaces the old-fashioned way. 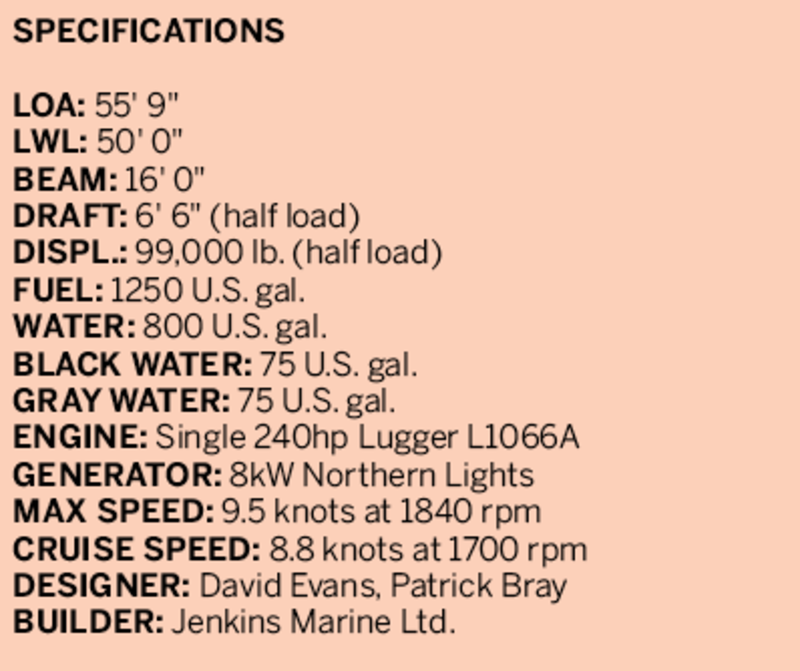 Her substantial 6-foot 6-inch draft may well limit Pisces’ access to inshore waterways, but it allows an interior configuration appropriate to Evans’ 6-foot-2 stature, while preserving a topside profile in proportion to length. Headroom in the galley is between 86 (outboard) and 91 inches (on centerline), with comparable dimensions at the helm, and plenty of vertical clearance for a raised settee forward on the starboard side. 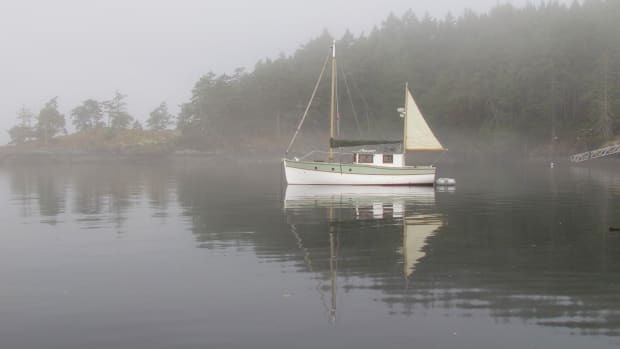 Interior joinery, for the most part executed by Keith Battersby, a cabinetmaker and wooden boat-building specialist in Saanich, B.C., is primarily Alaskan yellow cedar with contrasting moldings and accents of afrormosia. Windows and weather doors are custom-built by Diamond Seaglaze, and cabin soles are finished with Brazilian brownheart, a dense, durable species with a dark brown coloring and even grain. 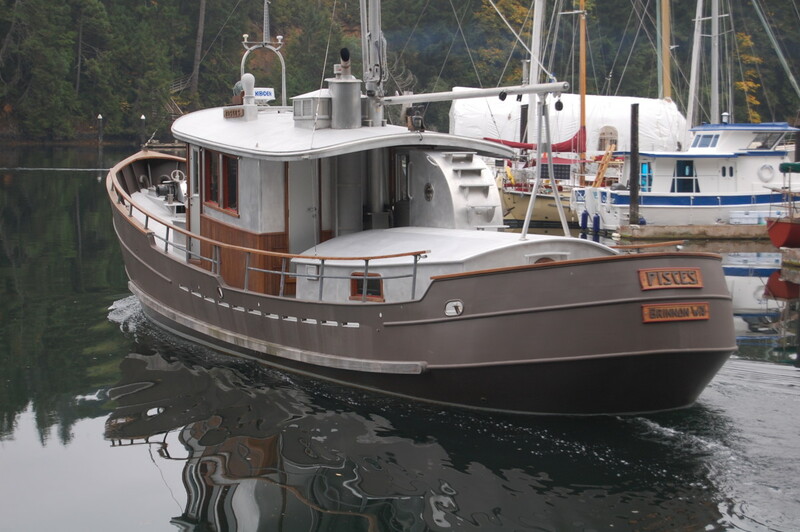 Launched in mid-2010, Pisces was next moved from Victoria to Port Townsend, Washington, for a final fit-out to complete a lengthy four-year build. 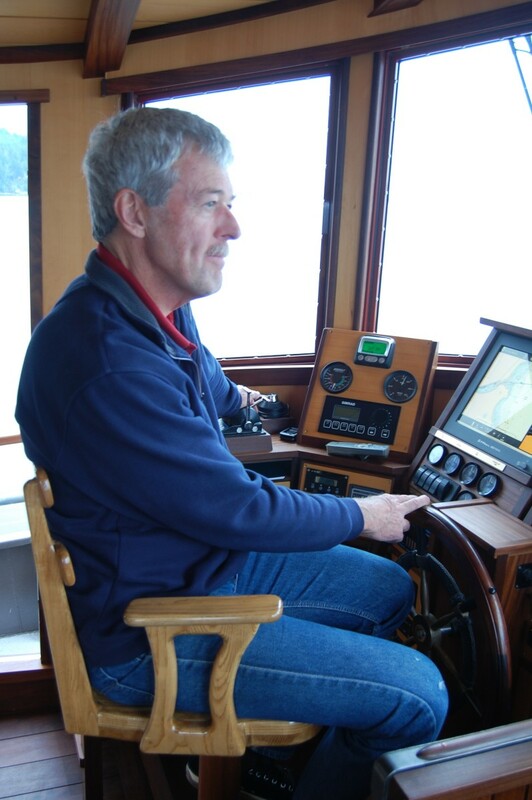 “Port Townsend was a logical choice; the community offers an impressive resource for this type of work, including boatwrights, mechanics, electricians, and joiners, essential to installation of remaining systems and finish work,” Evans says. Among local suppliers here was Galen Marrs Woodworking, whose services were enlisted for completion of finish carpentry in the aft cabin and forward accommodations. How is that for confidence? 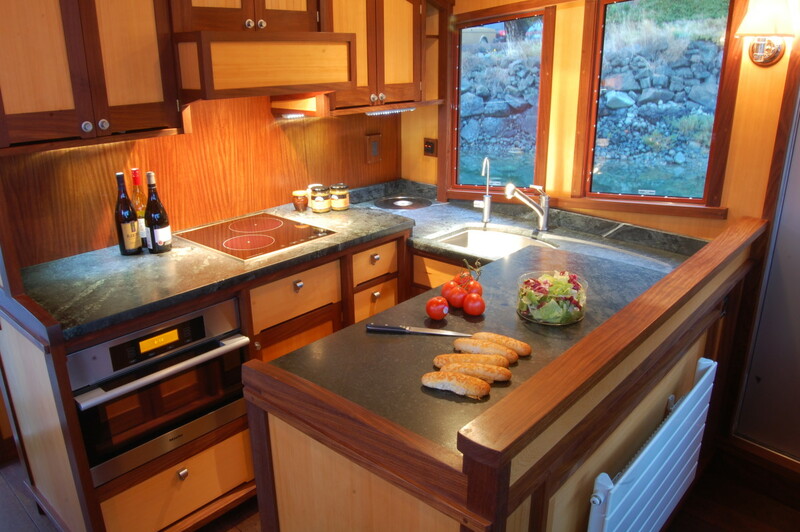 In the main cabin, the port-side U-shaped galley features a classic soapstone countertop with stainless steel sink. Fixtures and appliances, on the other hand, are uniformly up-to-date, and include LED lighting, a Miele combination microwave/convection oven, Kuppersbusch induction cooktop, and an over/under refrigerator/freezer with doors faced to match the surrounding cabinetry. In lieu of a conventional dining settee or table, Evans has opted for a counter surface built against the starboard-side cabin windows, capable of seating two on bar-type stools. The forward observers’ settee presumably could be fitted with a pedestal table for added dining space. A narrow companionway descends to a guest accommodation beneath the foredeck. Here, an overhead skylight provides natural illumination for two single berths, one against each hull side, with access on the port side to the stand-up mechanical spaces just aft. In the forepeak at this level—and another nod to the seagoing tradition—is a guest head, fitted with a large shower stall lined with panels of sandstone veneer. Yes, sandstone, in this case reinforced with a fabric substrate and sealed against saturation and mildew with multiple applications of a synthetic moisture repellant. The material’s bold grain patterns produce a dramatic effect, in rich organic tones consistent with the broader interior theme. All business on the out, Pisces is warm and homey on the inside. A weather door in the main cabin’s aft bulkhead opens to an athwartship breezeway separating the two deckhouses. 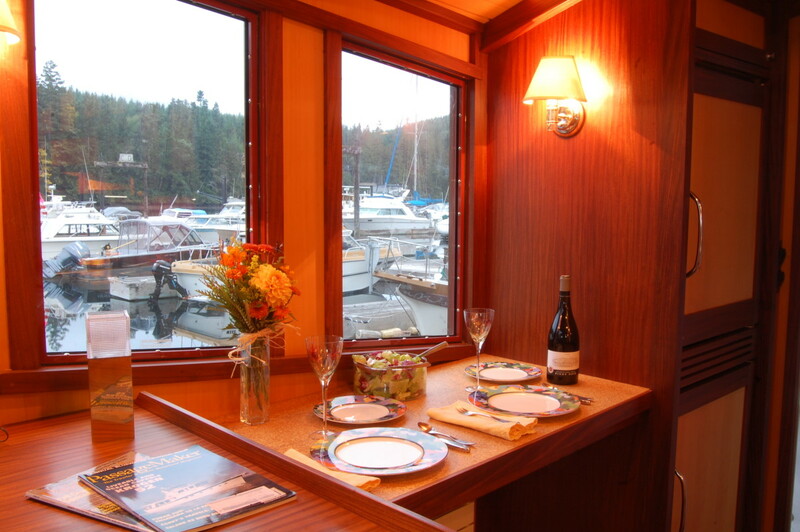 A second door at the latter structure offers access to the owners’ suite, itself with an impressive maximum headroom of 90 inches at centerline, and plenty of space for a king-size island berth, with lockers and shelving built into the recesses formed beneath the surrounding exterior decks. The adjoining master head also features sandstone wall and shower facings, and a soapstone countertop at the vanity. Here and throughout the living spaces, hydronic radiators deliver comfortable even heat—less a luxury than a requirement in the often-chilly precincts of Pisces’ home waters. 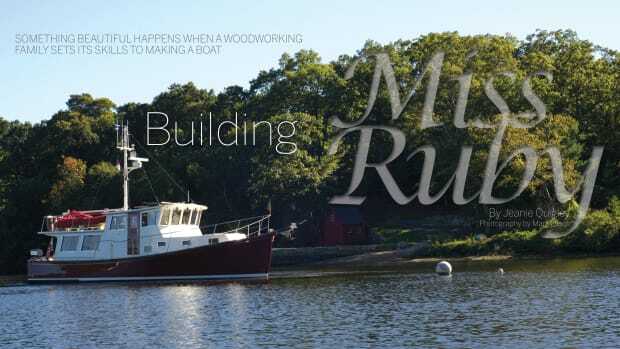 While the underlying design and construction are admirably simple and straightforward, the range and diversity of boat’s onboard systems are more complex. Fortunately, the engine room offers sufficient volume to accommodate—in addition to the main engine, fuel board, electrical panels, hydraulics and filters—a Dutch-built Kabola B-tap 24VAC boiler for the heating system and hot water supply, a 70hp Daewoo auxiliary engine with its own dedicated propeller shaft, and a compact work station with bench and tool cabinet. Understandably, it’s a little crowded, but the stand-up space and judicious placement of deck hatches offer reasonable access, a prerequisite for proper maintenance and repairs, to all equipment included therein. Beneath a raised platform on the aft deck, a lazarette accommodates the genset, and provides stowage space for fenders, crab pots, cleaning gear, and a spare propeller. A skylight provides interior brightness without draining on the batteries. Finish and fit-out of topside decks closely follow Pisces’ design brief, with mooring bollards, bitts, and ring cleats of unpolished stainless steel, and exposed frames limbered at deck level to channel runoff directly to freeing ports. On the foredeck, a Spencer-Carter hydraulic windlass features a dual wildcat, dual capstan design to handle both 140-lb. Pool-type anchors—one with 300 feet, the other with 500 feet of chain. On the aft deck is a 10-inch hydraulic warping capstan. 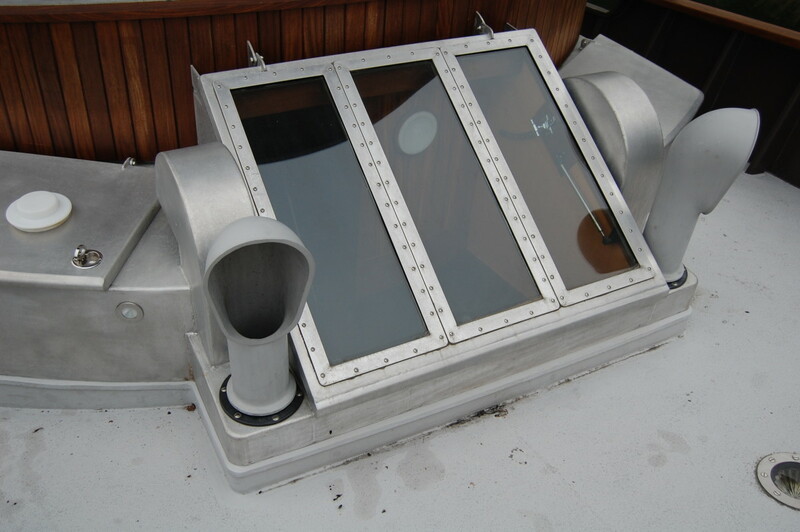 Five steps, welded to the curved roof of the aft cabin companionway enclosure, provide access to the main cabin top for servicing signal antennas and navigation lights. A tall aluminum mast, stepped through the main cabin top to the steel deck, supports a boom for deploying a Zodiac life raft and a 10-foot Minto classic dinghy. A hinged panel built into the main cabin aft bulkhead opens for access to a docking station with a secondary navigation display screen and a Kobelt plug-in handheld control pod for the rudder, transmission, and bow thruster. The fully insulated hull and soft engine mounts permitted little mechanical noise and virtually no vibration to penetrate the main deckhouse as Evans on a crisp autumn day, guided Pisces away from her berth at aptly named Pleasant Harbor, and into the narrow entrance leading into Hood Canal, a long, narrow arm of the Salish Sea west of Seattle. While millpond-calm conditions near the mouth of Dabob Bay offered no opportunity to evaluate anything near rough-water ride characteristics or effectiveness of the hydraulic stabilizers, the hull’s mass, big keel, and draft combined to convey a solid feel underway; Pisces held lateral trim through moderate turns, with no wallowing at her top speed of 9.5 knots. Predictably, the big fishtail rudder responds immediately to the helm, to the point where it adds credence to the old course-keeping mantra, “steer small,” and may even call for calibrating the autopilot to issue smaller increments of correction than a conventional rudder might require. 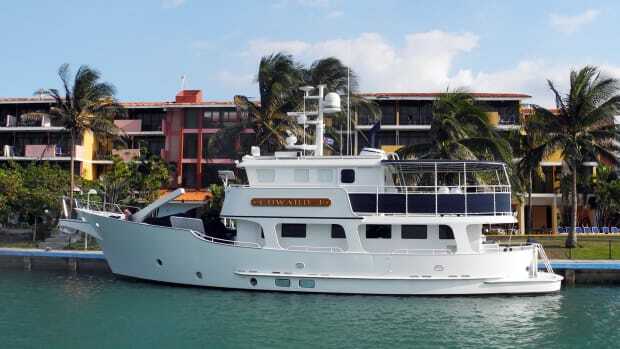 As he contemplates a cruise agenda over the coming months, Evans currently is planning a schedule of charter service, or possibly even outright sale. While the distance from his Denver home and business limits the time he has available for attending to the few finish details and installations that remain in this project, Pisces is sufficiently near completion to offer the promise of leisurely and lengthy voyages throughout the region’s waterways, and already has performed to Evans’ lofty expectations on a series of open-water ferrying sorties among the region’s boatyards. Back at the marina, Evans carefully backed down a narrow fairway, then, once again using the rudder-thruster combination, nudged his boat laterally to starboard, to ease Pisces into a berth scarcely longer than herself. With a workmanlike demeanor, no-nonsense bill of materials and functional arrangement, this unusual vessel already has begun to take on a patina of useful service that only seems to amplify her original brief—a mandate that values function over slick appearance, and makes the most of the old and the new alike. The rounded stern reveals quality of welds; half-round bar stock conceals seams at knuckles. Hullside guard strip is of purpleheart, a dense and durable tropical hardwood species especially resistant to crushing and shock loads.